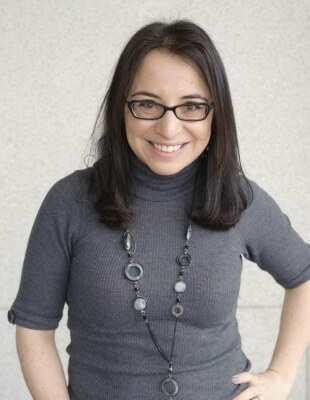 This post was first published on April 16, 2015. A few weeks ago I saw a recipe for Roasted Radishes on my Facebook feed. I remember it looked intriguing as I have never seen or had cooked radishes, but I didn’t click on the link and didn’t save it. So, I’ve been trying to find that particular recipe as I remember the picture looked pretty, but I couldn’t. Since then I’ve been a little bit obsessed with the radishes and I kept dreaming of making them. In my mind I had a beautiful dish of gorgeous round and long radishes, tiny cute carrots and even baby yellow beets. Well, that was in my mind. In reality I have never seen long radishes in my local store. Ditto yellow beets. And those cute tiny baby carrots, well, I could not make myself pay 8$ for a small bag at Costco. I did consider growing my own radishes and beets and carrots. I have already experimented with growing those cute long French radishes a couple of years ago and they turned out great. So, after remembering my weed-radishes, I decided against planting them this year. I went to my local grocery store and surprisingly they had bunches of young carrots. Yes, those carrots weren’t as tiny and cute as the ones I saw at Costco, but they were a lot cheaper. As it turned out, Roasted Radishes dish is not too uncommon and there are a few recipes online. I have not followed any of them in particular, I only used them as a guide and mostly for temperature. Up until the end I wasn’t sure if my Roasted Radishes and Carrots with Thyme and Lemon will turn out fine. But oh man, was I surprised! They turned out delicious! Cooked, yet still a little bit crunchy. Mild in flavour, but also spicy. Lemony, salty and sweet. 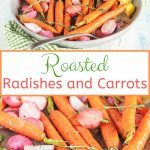 These Roasted Radishes and Carrots tasted very fresh and vibrant and full of Spring! 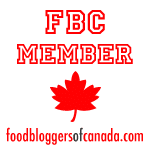 Did you catch my other recipe featuring roasted carrots? Try my Sheet Pan Fish Cakes with Roasted Carrots and Asparagus for a whole spring meal made on one pan in the oven! Ingredients are pretty much self-explanatory and they can also be changed up to suite your taste. The flavour of this side dish is very buttery yet there’s no butter and the recipe is actually vegan! Add other herbs such as rosemary, oregano, savory, or tarragon. Use lime juice instead of lemon juice for a more exotic and tropical flavour. If you don’t follow vegan diet, then add a bit of butter 5-7 minutes before the end of cooking time, and return to the oven so that it melts. Add small yellow beets cut up into similar sized pieces to the radishes and carrots. 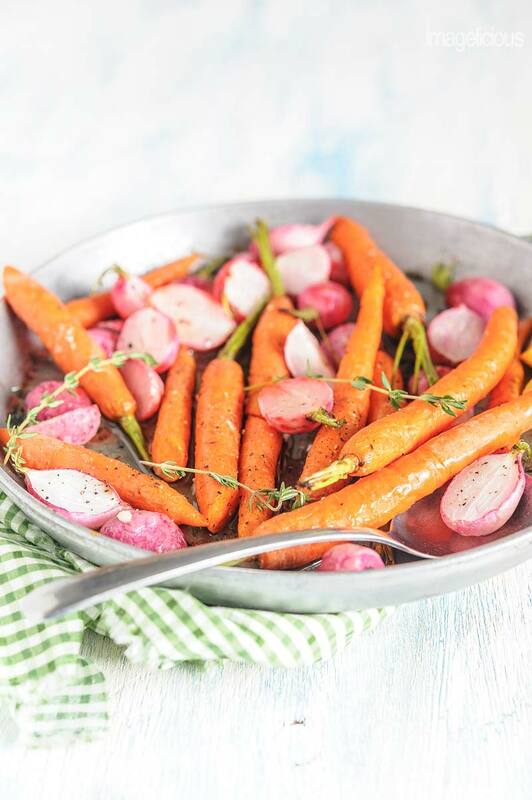 If you can find beautiful heirloom carrots then this dish will look absolutely stunning. If you aren’t following vegan or gluten-free diet, then mix up some breadcrumbs with parmesan cheese and add to the vegetables 10 minutes before they are done as a delicious and crunchy topping. 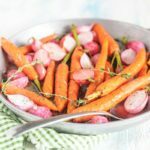 Making Roasted Radishes and Carrots is really easy, basically the name of the dish tells you exactly what you need to do. Halve smaller radishes and quarter the larger radishes. TIP: it’s much cuter if you use the radishes with a little bit of stalk still attached to them. Scrub the carrots and leave a little bit of stalk attached. Cut the carrots in half and if they are too thick, then slice them lengthwise also. 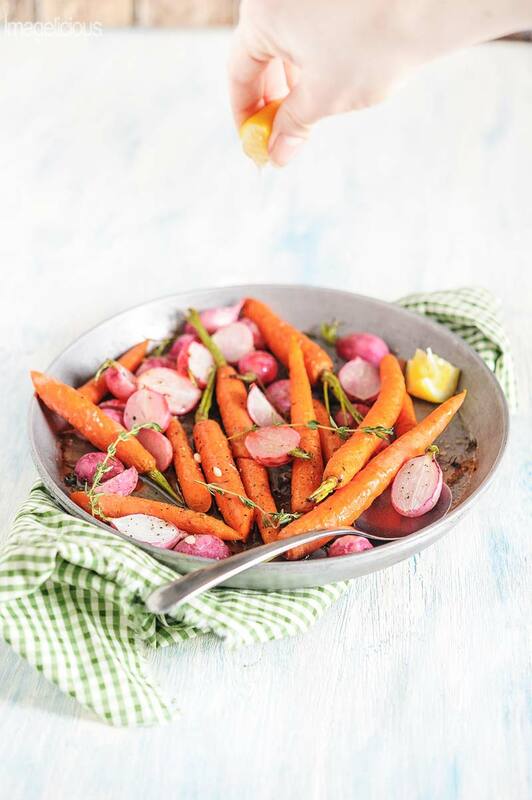 Arrange the prepped radishes and carrots in a small roasting pan, sprinkle with salt, pepper, and fresh thyme; drizzle with olive oil and some freshly squeezed lemon juice. Roast at high heat so that the sugars caramelize and the vegetables get cooked through yet still crispy. 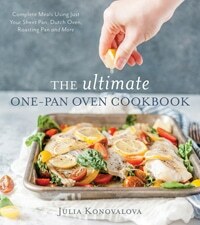 If you love this recipe, then you must buy my new cookbook, The Ultimate One-Pan Oven Cookbook, it has 75 recipes that are all made in the oven in one pan. I love this recipe so much that I even included it in that cookbook! Wash the radishes, cut the greens off leaving a little bit of the stalk. Cut the root off. Cut the medium radishes in half, large radishes in quarters and leave small radishes whole. Wash and scrub the carrots, cut the greens off leaving a little bit of the stalk. No need to peel them since they are young. Cut long carrots in half. Leave smaller carrots whole. If the carrots are thick, then cut them lengthwise also. 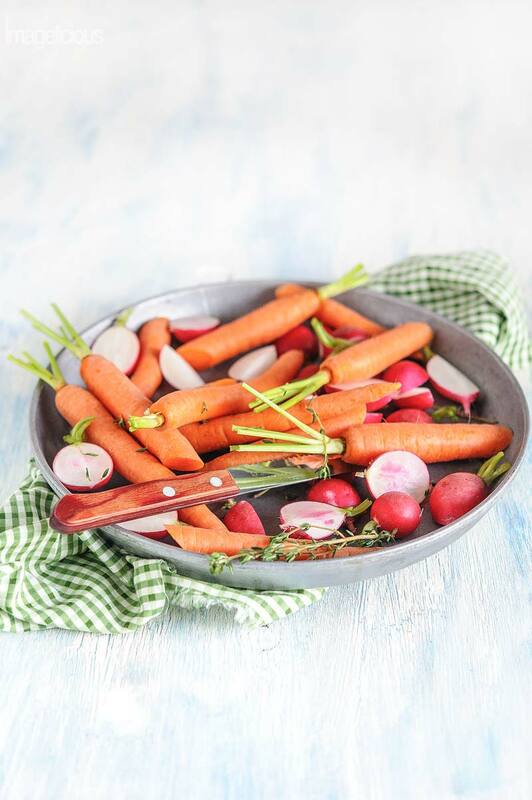 Place the carrots and radishes into a baking dish in one layer, pour the olive oil, add salt and pepper and mix. Take the thyme leaves off the stems and sprinkle on top. 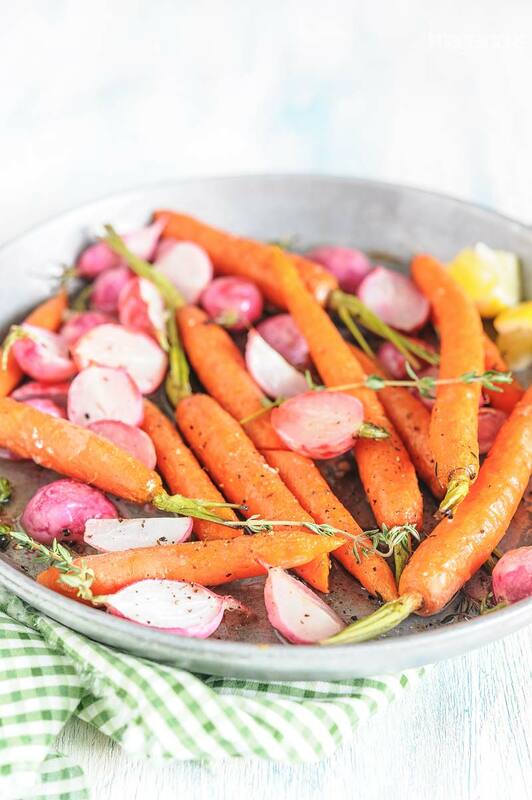 Place the roasting pan in the oven and bake for 20-30 minutes depending on how cooked you like your vegetables. Pierce the veggies with a sharp tip of a knife to make sure that vegetables are cooked. You should be able to insert a knife easily. Take the dish out of the oven. 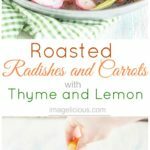 Squeeze lemon juice on top of the Roasted Radishes and Carrots and serve.